History of the Cottage | Crafts Council of Ballarat Inc. The Crafts Council of Ballarat operates the Adam Lindsay Gordon Cottage in the heart of the Ballarat Botanical Gardens. The Cottage, reputed to have been the home of renowned Australian Poet Adam Lindsay Gordon is stocked and staffed on a volunteer basis by local artisans. In the early 1990’s, the Crafts Council of Ballarat was offered the use of the Cottage by the Ballarat City Council, to activate that area of the Gardens, the offer was accepted with great pleasure, and we continue to use the Cottage to this day. Although not officially an information centre, there is a lot of information about Adam Lindsay Gordon available in the Cottage. Displays in the Cottage are continuously changing, according to the seasons and type of artisans currently members of the Crafts Council of Ballarat. Pieces range from traditional baby wear to contemporary baby wear, traditional artwork to contemporary artwork, lovely scarves, knitted, crocheted and felted, some with hats or mittens to match. Tiny treasures for the young and old, brooches to delight all ages. There are fairy wands for the mystically inclined and walking/hiking sticks for the physically challenged. The Crafts Council members are actively involved in the Begonia Festival with not only the Cottage open but the addition of outside stalls and demonstrations. Members regularly participate in larger activities that occur in the Botanical Gardens, holding workshops and activities for children during Children’s week, and also conduct outside projects to assist with the promotion of the Arts in the Ballarat region. All Crafts Council members have a commitment to the upkeep and presentation of the display within the Cottage, including the quality of the crafts for sale, the Cottage appearance and good customer service. Members are rostered on to do duty at the Cottage, and this means that the public and the artists come into contact, an exchange which seems to be valued by both. The Conservatory in the Gardens is also activated for 10 days commencing the Queen’s Birthday weekend in June, with an Exhibition of members’ works, featuring a different theme each year. This gives members a chance to stretch their artistry and create something larger and different to pieces created for the Craft Cottage. 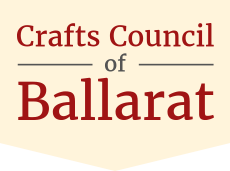 Crafts Council of Ballarat is always happy to welcome new members, to become a member persons must live in the local area, and be available to work in the Cottage on a roster system. If you are interested go to our Contact Us page.